Not content merely with creating beautiful music for us, some composers and performers were also talented visual artists. Here's a selection of the best - from Mendelssohn to Mozart. From an early age, Felix Mendelssohn produced drawings, watercolours and oil paintings with great skill. 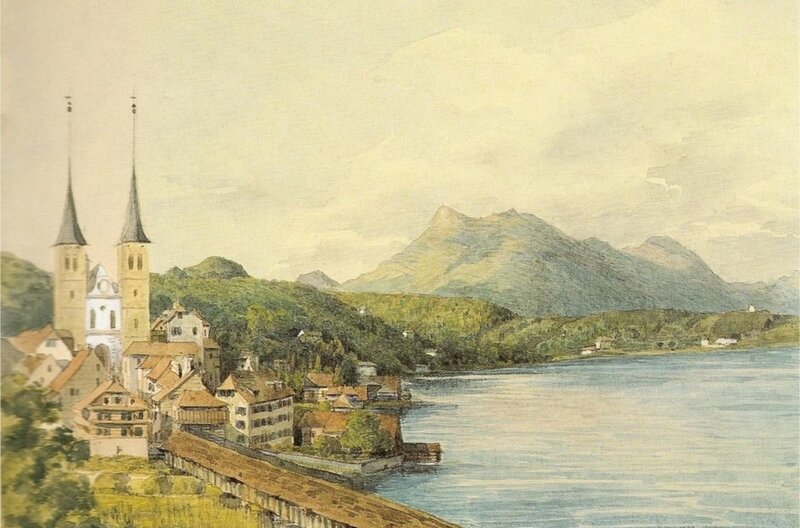 Here he captures the tranquillity of Lake Lucerne in Switzerland, in 1847. Mendelssohn was as good as many visual artists of his time. He produced more than 300 artworks. His landscapes and cityscapes demonstrate his formidable technique. Musically they were poles apart, but Gershwin and Arnold Schoenberg became friends when the arch-modernist arrived in Los Angeles in 1935 as an impoverished exile. Both men shared passions for painting and tennis. Gershwin was the better painter, but at tennis Schoenberg refused to yield a point, stomping off like John McEnroe, if challenged. Arnold Schoenberg had an enduring friendship with the pioneering abstract painter Wassily Kandinsky and they exchanged paintings with each other. They both believed art should express the subconscious. Schoenberg's stark expressionism is vividly seen in this portrait, possibly of himself, with its penetrating, red-eyed gaze. Is there anything Stephen Hough can't do? He's a pianist extraordinaire, a composer, professor, poet, newspaper columnist, blogger - and painter. No wonder 'The Economist' named him as one of 20 Living Polymaths. He even had a solo exhibition of paintings in London in 2012. Picture: Stephen Hough. Not quite a master of fine art, but the greatest tenor of the early recording era, Caruso (1873-1921), was a talented caricaturist. Here's a cheeky, autographed self-portrait he scribbled for a fan in 1909. Picture: Schubertiade Music & Arts. The great Russian bass, Feodor Chaliapin (1873-1938) was also celebrated for his drawing skills. Here is his sketch of the baritone Lawrence Tibbett (1896-1960), who made his debut at the Met in November 1923, alongside Chaliapin, whom Tibbett greatly admired. Picture: Schubertiade Music & Arts. The superstar Mexican tenor Rolando Villazón (1972-) is not only a great singer - he can knock out a great little cartoon too. Here's his version of the great Italian opera composer, Giuseppe Verdi.